Managed to connect to Steam and unlock an achievement, yusssss! I think that’s the hardest part out of the way now. Since I’ve got the game communicating with Steam, the rest of the features should be quite easy to add. Also, the game works fine if you run Steam in “offline mode”. A lot of people were asking if they would need an internet connection, and you don’t, unless you want to use cloud saving. 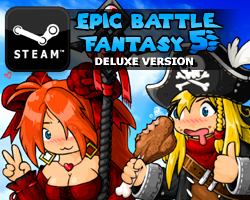 This entry was posted in Epic Battle Fantasy 4, Game News on February 12, 2014 by Matt Roszak. I hope the files will say .meow once I get it for steam, it will make me as excited as a kid on their first Christmas. I thought i’d scribble a comment down, as I’ve played/followed your work for many years since I stumbled across the first “Epic Battle Fantasy” on Newgrounds(?) years and years ago. Being able to watch your transition from pretty amateurish (although impressive) work all the way to being published on a platform like Steam is an impressive feat and I have been eagerly awaiting the release of EBF4 on Steam, and will be buying at least one copy. 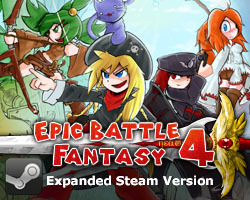 Your game/s since EBF2 are very worthy of actual platforms, and I hope you continue developing games with that semi-old-school feeling and genuine atmosphere. It is good to see you getting some of the credit and attention you have deserved. I’d be willing to bet there are a lot of people like me, who are quite actively following you and never speak up, but I thought i’d pass along some random encouragement (or just random commentary) and praise. Sooo, how much of the conversion from EBF4′s initial release to the steam release have you done percentage wise? I’m just curious about how much work it was. Have you gotten to the 95% mark yet? I have a game which is being at 95% mark for 2 and a half years. Those percentage marks mean nothing, trust me. Percentage marks do mean something if the game’s maker keeps working consistently, and I believe he is. It’s more like the difference between on-the-spot human guesses and solid statistical approach to calculating how long certain tasks take to do. Even if Matt replies, guessing some X%, it will have no meaning. If Matt gets the average time of all kinds of tasks, sums up times of all tasks left to do and divides by the total time needed to spend on the project, it will be absolutely precise (unless unexpected events happen). But that takes time to do, and a bit of effort (tasks are many). And it may not be precise in the end. My final point is that you need not orient on percentage, but on release dates that have already been announced: end of February (I know it’s not a precise date). Will that date be met, or not – depends on your belief in Matt. I remember when I first played EBF3 my internet was so slow I got that medal before the game actually loaded. 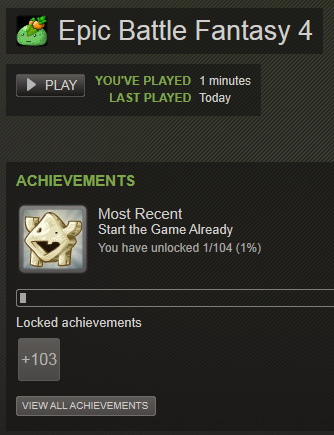 Hmmmm, there are 104 Steam achievements? So there is more of them than medals, what is the cause of it? Whenever i look at this slime icon it reminds me of Bastion, guess why. Did you already decided how many trading cards will be avaliable? Weird question time – is “sz” in “Roszak” a polish “sz” or just a coincidence? It disturbs me since I read that personal life earlier entries. Great work with that Steam features. I feel kinda bad for asking a lot of questions. We’re getting ever so closer to the release!